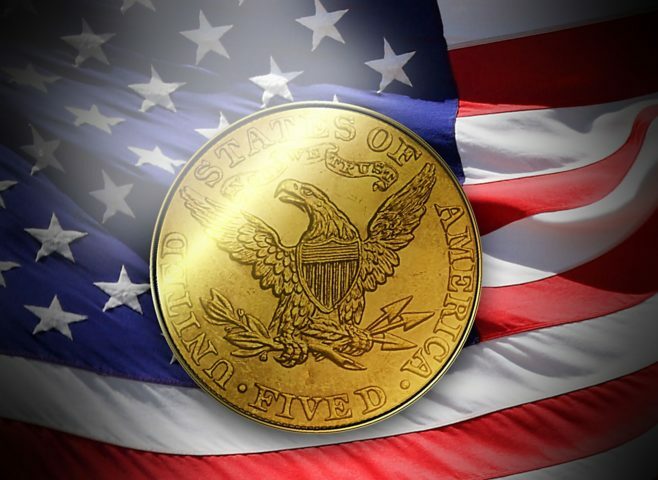 As is the case with most other coinage, there are several types and denominations of U.S. gold coins. There are too many to list in one or two articles, so I’ve decided to pick a few to go into more detail on. The 4 I’ve chosen are the most common of the gold coins (they’re all types of Eagle coins). 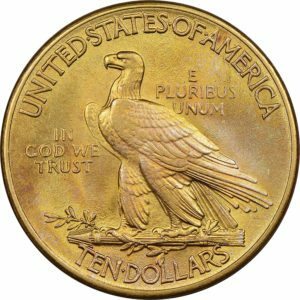 What Are Gold Eagle Coins? Eagles are gold coins that have been given that name due to the different types of eagles depicted on the coin’s reverse side. The Indian Head Quarter Eagle gold coin has a denomination of $2.50. It was minted from 1908 until 1929. The design on Quarter Eagles and Half Eagles is unique in U.S. coin history — because instead of the design being embossed onto the coin, it is actually sunk into the coin. These are known as incuse coins. Rumors about the incuse design holding onto dirt and germs made these coins unpopular with the public. These Quarter Eagle gold coins range in value from $320 in Very Fine condition to $500 in MS-60 condition. NOTE: A lot of times, you can’t go by the book prices with gold coins — due to the gold market fluctuating so much from day to day. One day gold may be down and the coin would be worth more just for the type of coin it is, and the next day gold could be way up in the market and it would be worth more for its weight in gold than the scarceness of the coin. 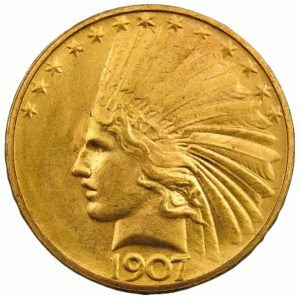 Minted from 1908 until 1929, this $5 gold coin is by the same designer and depicts the same design on the front and reverse as the Indian Head Quarter Eagle, only the denomination is different. 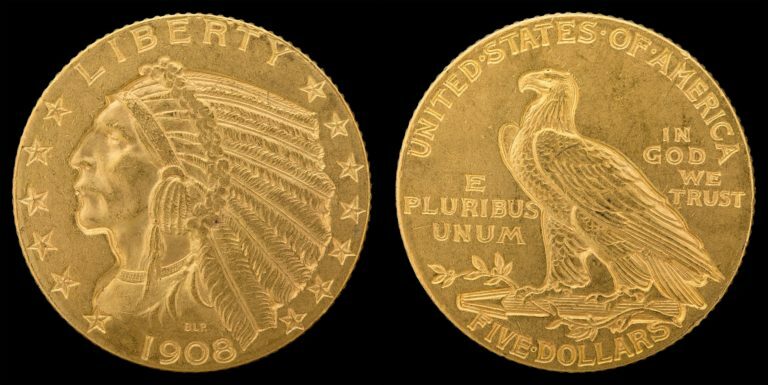 Did You Know?… Theodore Roosevelt wanted a redesign of U.S. coins — which led to these Indian Head gold coins. This $10 gold coin also has an Indian Head obverse but it is a much different portrait than the one on Quarter Eagle and Half Eagle gold coins. Minted from 1907 until 1933, the Plain Eagle gold coin shows the head of Liberty crowned with an Indian war bonnet — and a standing Eagle on the reverse. 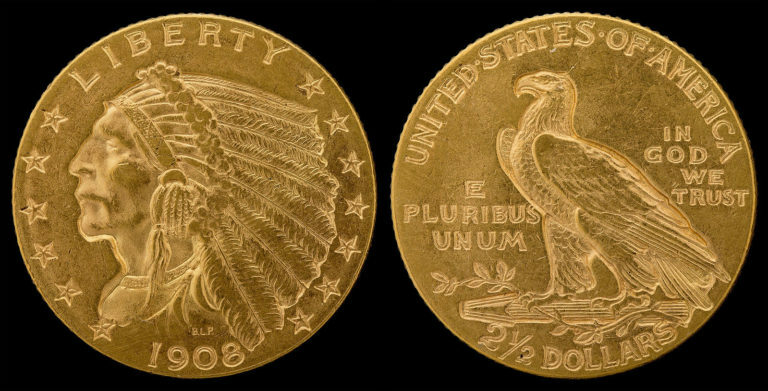 The Indian Head Eagle gold coin was designed by Augustus Saint-Gaudens. You may have heard that name before. Saint-Gaudens is considered by many to be the greatest of modern sculptors, and it shows on his coin designs — especially his Double Eagle design (below). Minted from 1907 until 1933, the designer of this gold coin was Augustus Saint-Gaudens — who was known to be one of the greatest modern sculptors. And I have to say, his work on the Double Eagle coin certainly didn’t hurt his career any! This $20 gold coin is considered by many to be the most beautiful U.S. coin ever made. In fact, it’s one of the most sought after coins in the hobby. The obverse depicts Liberty walking with her skirt flowing around her, and she’s holding a torch out in front of her. The reverse has a picture of a flying Eagle with the sun coming up from the bottom of the coin and its rays shooting up behind the Eagle. This gold coin holds the record for the most money ever paid for a single coin at a coin auction. 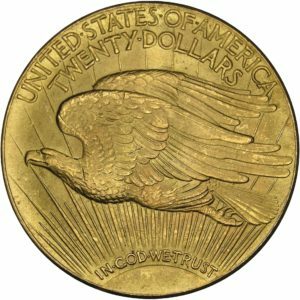 In July of 2002 at an auction held by Sotheby and Stack, a 1933 Gem BU (brilliant uncirculated) Saint-Gaudens Double Eagle sold for $7,590,020. Yes, you read that correctly. That’s over 7 MILLION dollars for one coin — more money than I’d likely ever see in 5 lifetimes! 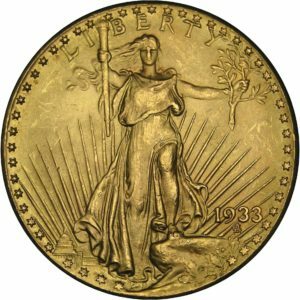 It sold for so much because all of the 1933 Double Eagles were supposed to be melted down by the U.S. Mint. Only 13 are known to have survived, and that one is the only one that has ever been on the market. Just in case you were wondering, second place for the highest amount paid at a coin auction isn’t even close to what was paid for the 1933 Saint-Gaudens gold coin. There’s about a 3 million dollar difference. 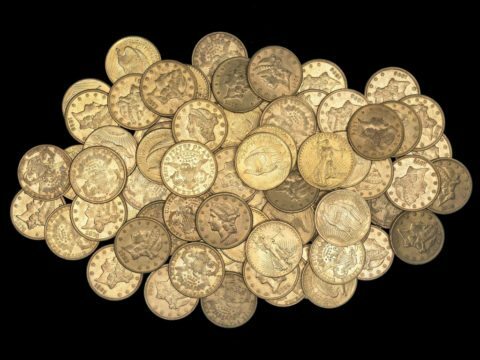 There were many many types of gold coins produced, but it would be nearly impossible to list them all in detail here.